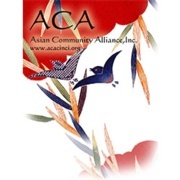 The Asian Community Alliance (ACA), a 501 (c) (3) non-profit organization has served the Greater Cincinnati community since 2004. The mission of the organization is to provide culturally sensitive services/programs to the over 49,000 Asian Americans & Pacific Islanders in the counties of Butler, Clermont, Clinton, Hamilton and Warren counties. Our programs include, but are not limited to: access to healthcare, aging/caregiving, domestic violence, sexual assault prevention, elder abuse, computer literacy for refugees and immigrants, civic engagement, and youth leadership. We have designated the generous donation from the Wine Festival towards making a difference for vulnerable Asian youth in this community. We believe that we need to equip our kids with the necessary tools to overcome the cruelty and intimidation they may encounter as they mature. We want to prevent devastating mental, physical and emotional trauma in these young lives. We worked diligently in 2014/2015 to build relationships between our Asian American youth within different ethnic communities, prepare them for the myriads of challenges they may face as children, teens, as well as when they move on to experience life as University students. Based on requests from the youth, we brought in experts to present on topics such as Stress Reduction Techniquesand Interviewing Skills. Building on our success, in 2015/2016 we are addressing the issue of bully-prevention. Bullying is a form of violence that is likely widespread but often under-reported. National data according to Indicators of School Crime and Safety: 2010 report shows: fewer Asian American students (18%) reported being bullied at school or cyber bullied, compared to Whites (35%), Blacks (31%), and Hispanics (28%). More Asian American victims of bullying say that they were bullied because of their race (11.1%), compared to Whites (2.8%), Black (7.1%), and Hispanic (6.2%). The training will be lead by a team consisting of a clinical psychologist, social worker, school board member, and teacher. ACA is currently in communication with the greater Asian community to coordinate efforts to hold our first bully-prevention event in late fall/early winter.